So what is the Lifestyle Shopping Center? How are lifestyle centers different from a regular mall? Edward Burzminski, President and CEO, Chamber Marketing Partners which publishes magazines for communities and Chamber of Commerces says they are an attempt to recreate the “Main Street” shopping of yesteryear with a contemporary, upscale vision. The ICSC, the International Council of Shopping Centers defines Lifestyle centers as specialized, upscale shopping centers. He says they are different from regular malls becuase they are designed from the outset to create a destination-like experience with lots of outdoor space, cutting edge dining, garden-like areas, upscale stores, movie theaters, pet parks, gyms, and sometimes even condos and hotels. Lifestyle centers are growing in part as a response to online shopping applying pressure traditional brick and mortar stores and because many traditional malls have become boring. How are lifestyle centers changing the shopping experience? Burzminski says Lifestyle centers are making the shopping experience more fun! In Los Angeles developer Rick Caruso was an early Lifestyle center pioneer with his “Americana at Brand” in Glendale and “the Grove” in LA. Both are outdoor malls that create a family entertainment environment with grassy picnic areas, cutting-edge dining, beautiful architecture, Bellagio-style water shows, toe-tapping Rat-Pack music playing in the background and both even have actual old-time trolleys to ferry shoppers from one end of the mall to the other. The trolley drivers at the Americana were on a first-name basis with my 90-year old mom because she loved riding the trolley so much. In Century City, along with 8 acres of open space and gardens, trees and creative outdoor seating, about 25% of Westfield here is dedicated to cutting edge dining. Restaurants tend to benefit other tenants by keeping malls busy well into the evening. What is the goal of theLifestyle center? 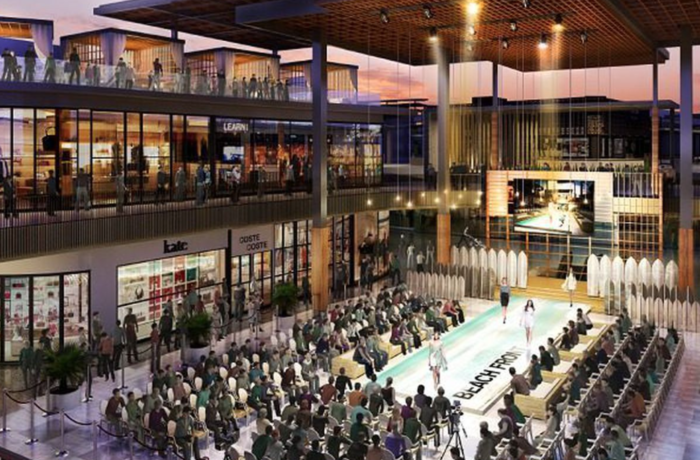 Lifestyle centers’ want to connect with a wide range of discerning shoppers to get them out of the house and offer an alternative to online shopping. The convenience of online shopping through sites like Amazon.com and others has been chipping away at traditional brick & mortar retailers. Stores like JC Penney and Macy’s recently announced significant numbers of store closings. Lifestyle centers may be tapping into a desire to create a community, a Main Street shopping experience where people can stroll, gather, shop, eat and be entertained. Millennial shoppers are responding. Millennials often prefer to buy trusted brands at brick and mortar stores where they can touch and feel and try-on the products they are buying. Approximately 20% of consumers who return an online purchase at a store make an additional purchase. And 71% of consumers surveyed would choose to purchase the product in store, if told online the item was in stock. While it may seem counterintuitive, a majority of millennials trust what they read in print more than what they read online. They know all too well how easy it is for just about anyone to post information online which may or may not be accurate while perceiving that print requires more validation and verification. While total online retail sales in 2015 were a substantial $300 billion, that represented only about 9% of total retail spending for that year. But the trend is growing and brick and mortar companies are responding. Burminski says Fashion Island in Newport Beach, Caliofrnia is another great outdoor Lifestyle shopping destination. I often take my family with our dog to Fashion Island just to spend an afternoon. We get lunch to go from one of the many nice restaurants and sit on the cushy outdoor chairs under the big sun blocking umbrellas. I’m usually the one sitting on the chairs with the dog after lunch reading a magazine while my wife and daughter go visit the shops.